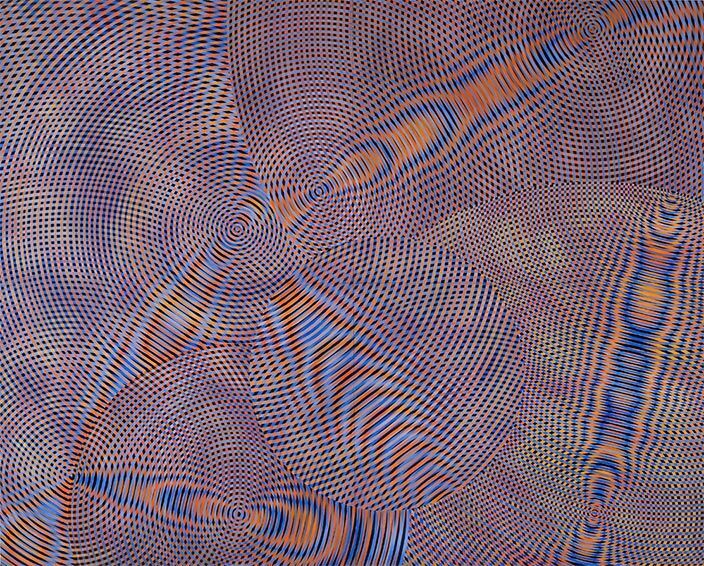 For over 20 years the Melbourne-based artist John Aslanidis has defined a space between sound and vision, through seeking to create ‘paintings you can hear and sound you can see’. His paintings take the form of numerous interlocking and exponentially expanding concentric circles that are painstakingly mapped and masked out, and evolve from an intersection between music and painting. This stream of artistic interrogation has an historical lineage that stretches back to the beginning of the twentieth century and the birth of modernism, yet the musical genre that Aslanidis responds to is rooted in the electronic music movement that came to prominence in the 1990s. Creating paintings of vibrational vibrancy that actively engage with the science and perception of sound, his work reflects a confluence of visual and aural stimuli that also mirrors the phenomena of synesthesia, where the senses become blended. These are paintings that are experienced by the body and, as such, reclaim a contemplative awareness of the senses within the rush and tumble of the digital consumer age. Predating even the earliest modern painterly interpretations, the relationship between visual and auditory perception has long been reflected in musical language. For centuries musical sounds and the timbre or tone colour of different instruments have been spoken of as bright, dark, brilliant, and so on, with new musical colours created through combining instruments in infinitely variable ways. However, it was not until the evolution of the modernist project that visual artists responded to music through abstraction, with figures such as Wassily Kandinsky and Paul Klee making important contributions. Early approaches in Australia included the pioneering works of Roy de Maistre (1894–1968), who in 1919 paired the notes of an octave with colours to visually express a piece of music. While De Maistre’s work was first met with critical derision, the profound connection between abstract painting and music was to develop into a persistent arena of inquiry. More recently the field has included the atmospheric paintings of Donald Laycock (an early influence on Aslanidis) whose visual response to music resonates with simplified pictorial beauty and symbolic charge. Such works reflect an affective response to music that is fuelled more by emotion and imagination than rational analysis. Aslanidis’s work falls somewhere between these two approaches. He tempers mathematical exactitude that references the structures of sound and music, with an intuitive response to colour that harnesses its emotive effects on mood. Before commencing his Fine Arts degree at the College of Fine Arts, University of New South Wales, Aslanidis studied at the Conservatorium of Music. He has been heavily involved in electronic music since the early 1990s, first as part of Clan Analogue, a collective of visual and sound-based artists, and later signed as a visual artist to the record label Zonar Records, further immersing himself in the contemporary music which this 1990s subculture generated. There are a number of analogies between music and the way Aslandis constructs his paintings. 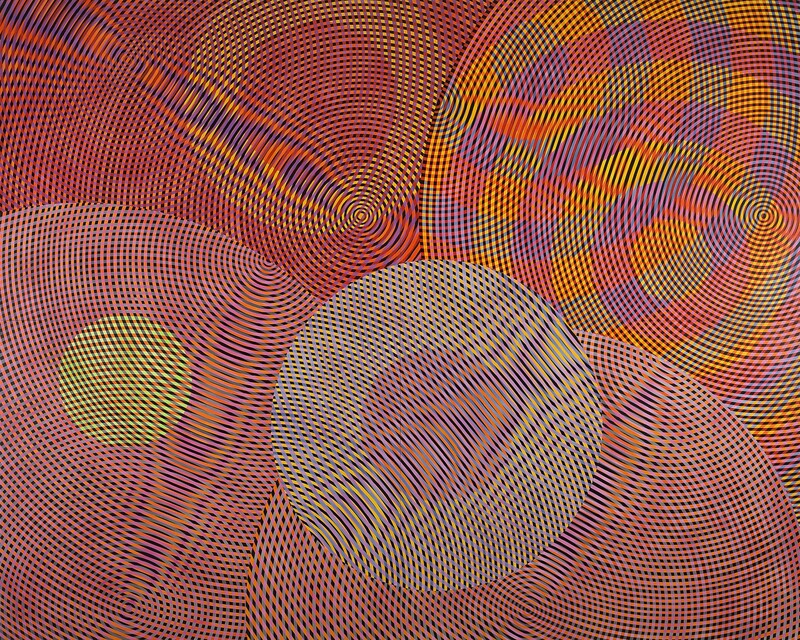 The most obvious is his labour-intensive process of masking out and exposing individual concentric circles, which are subsequently painted to create alternating curved lines of colour and tone. This results in a rhythmic oscillation between different colours that gives visual form to the pulse of a beat. The complexity is compounded when large masses of concentric circles overlap, perhaps suggesting the confluence of more than one bassline present in electronic music. This merge of larger forms often creates a moiré pattern in the work, which is an unpredictable outcome that in musical terms simulates the audible interference that occurs when two frequencies of a lower sonic register (like basslines) move in and out of consonance. Another striking parallel between music and Alsanidis’s art is the system of intervals, or access points, that he created in 1991 which govern the structure of his compositions. He has formulated an algorithm that mathematically positions the centre point for each of the radiating circles that traverse his works. This geometrical device acts as a foundation ripe for endless improvisations and alterations, depending on where and how he positions the points on the canvas. This in itself mirrors the way a musical score is structured, through a system of regulated intervals between notes which coalesce to form a whole. The aesthetic of Aslandis’s work draws on physical phenomena present within nature. 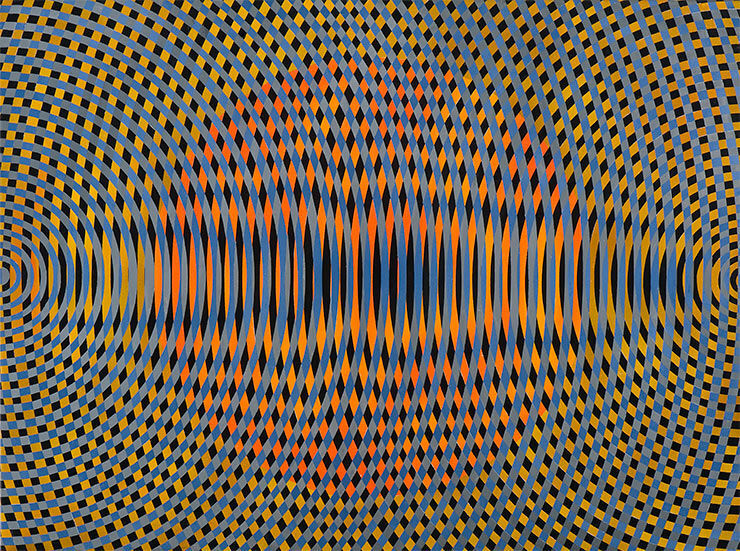 Much like the incursion of an object into water that creates infinitely expanding ripples, sound waves are essentially just vibrating air, and it is as if Aslanidis gives visual form to these invisible vibrations that cause auditory experience. Theoretically, his paintings could continue to grow infinitely following the repetition of the process as each circle is laid on the next. Limited only by the edge of the canvas, they seek to ‘capture a fragment of infinity’. In this regard Aslanidis’s work has a strong correlation with Emergence Theory, where complex patterns emerge out of multiple simple interactions, or the collective activities of many entities. It is this theory that explains naturally occurring yet intricate and repetitive shapes such as those found within snowflakes, or the ripples in sand dunes. In the same way that Emergence Theory can explain patterns within nature, scientists, artists, biologists and philosophers have for millennia linked geometrical formulas with naturally occurring structures. Arguably the most longstanding subject of this inquiry is the Golden Mean. This numerical ratio has been used since the Renaissance (and more recently by Australian artists such as Jeffrey Smart, Rick Amor, and of a younger generation, Eolo Paul Bottaro) to create a grid or spiral that is applied to the picture plane by artists to structure the composition an image. When used in painting it has the effect of keeping the eye within the frame of the canvas, so that it endlessly bounces off objects and forms. While also requiring a geometrical formula, in many ways Aslanidis’s approach to composition does the reverse, as his ever-expanding circles lead the eye endlessly around and out of the rectangle, rather than in. Conceptually, Aslanidis is not trying to illustrate sound but, rather, give visual expression to its physicality. He is concerned with the physical reaction the viewer has to his paintings and talks about the experience of an audible hum produced by looking at his works. This idea is closely related to the phenomenon of synaesthesia, a cognitive occurrence where the five senses – sight, sound, touch, smell, and taste – become blended and perception in one sense leads to an involuntary perception in another. For a person who has synaesthesia, the sound of a flute may look light blue, or the smell of beer and aftershave may result in a cloud of purple and green that surrounds the source of the odour. Science is still investigating this mysterious and wondrous occurrence that takes place in the synaesthetic brain. It was a subject of artistic fascination during the modernist epoch, and continues to intrigue a number of contemporary practitioners. Synaesthesia is also a theme explored in the current exhibition ‘Colour Music’ at Canberra’s Drill Hall Gallery, which features historical works by Frank Hinder, Roy de Maistre, Ludwig Hirschfeld-Mack and Jozef Stanislaus Ostoja-Kotkowski, as well as notable contemporary artists who work at this intersection of audio and visual expression. The exhibition features the latest in a series of collaborations between Aslanidis and Berlin-based British sound artist Brian May. For this work, Sonic Network no. 14 (2014), Aslanidis has created a monumental painting (300 x 488cm), which May responds to in a generative sound piece using a software synthesis program that actually measures the frequency of colour within the electromagnetic spectrum. In this and earlier collaborations between the two artists of a similar nature, May measures the colours present within the painting, and then divides the frequencies until an audio spectrum is reached and there are eight octaves to work with. Through arranging sounds produced by reading the oscillating and kaleidoscopic variations of colour and tone present within Aslandis’s painting, May creates immersive soundscapes that directly relate to the colours Aslanidis has put down on the canvas. In many ways these collaborations simulate an internal synaesthetic reaction of hearing sound when activating the visual senses, produced in the physical world for all to experience. This fusion of digital and analogue approaches also turns early attempts to paint music on its head, as here the painting informs the aural composition, and not vice versa. Across all of Aslanidis’s art, the overriding experience is one that brings the viewer back into an awareness of the body. 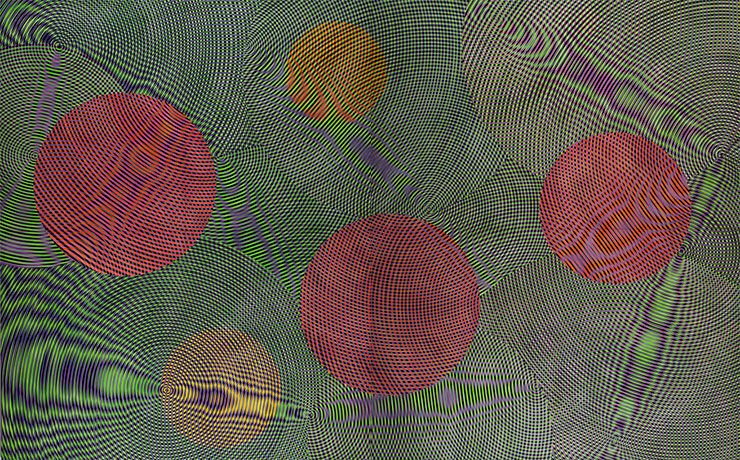 Eyes flicker and bounce around the canvas, responding to the shimmering tones and alternating bright colours that, massed together, appear anything but static. Some sensitive synaesthetic individuals may experience a hum, others may not, yet regardless the bodily response engendered, Aslanidis’s work stands apart in the field of music/painting. Through his adoption of the circle, one of most fundamental and universal of geometric shapes, Aslanidis consistently visions the intangible forces that shape our reality … like a macro/micro technicolour fragment of infinity, barely contained within the four edges of a canvas. ‘Colour Music’ is at Drill Hall Gallery, Canberra, until 28 September 2014. Unless specificed, all John Aslanidis references come from a conversation with the author, 28 January 2013. Steven Tonkin, Sight and Sound: Music and Abstraction in Australian Art, exhibition catalogue, Victorian Arts Centre, Melbourne, 2010, p. 4. John Aslanidis interviewed by Steven Asquith: http://www.artinfo.com.au/articles/read/john-aslanidis–sonic-networks-nos-4-7, accessed 23 January 2013. See www.abc.net.au/catalyst/stories/s528838.htm, accessed 3 April 2013. In conversation with Brian May, 9 December 2012. Tags: art, contemporary art, John Aslanidis, Marguerite Brown, Music, painting. Bookmark the permalink.